Fidelity’s Retirement Saving Guidelines – Are You On Track With Your Retirement Saving? Several years ago, Fidelity made a splash with cold hard retirement numbers. The discount brokerage powerhouse told savers and investors exactly how much they needed to save for retirement at each age milestone. By age 30, you need the the equivalent of one year’s salary saved. So if you make $70,000 per year, you should have $70,000 saved for retirement. Remember, this isn’t your emergency fund or the kid’s college fund! By age 40, you need three years salary saved for retirement. So, if your salary goes up to $100,000 by age 40, you need $300,000 saved for retirement. 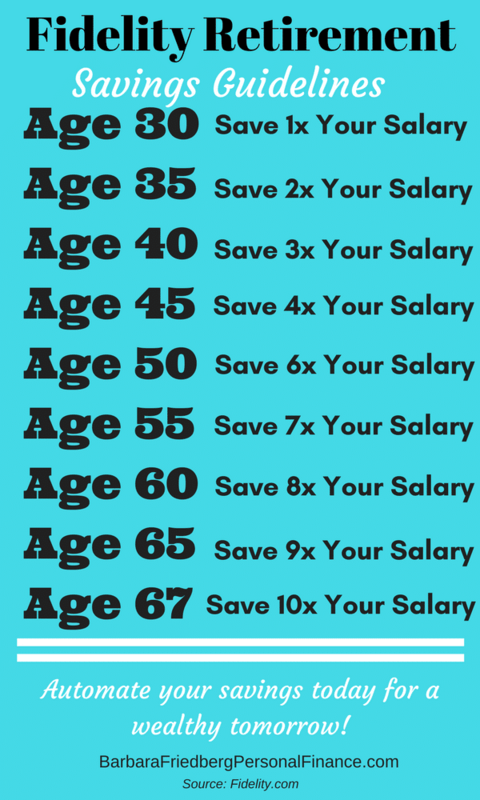 By age 55, you need seven times your annual salary saved. By age 67, your retirement nest age should equal ten times your annual income. So if you’re earning $185,000 per year at at 67, then you need $1,850,000 saved for retirement (according to Fidelity). Start saving 15% of your income annually starting at age 25. Invest 50% or more of your savings in stocks. If history is any guide, investing greater percentages in stock investments might yield a bigger retirement nest egg. Retire at age 67 with pre-retirement lifestyle. If you’re behind in your retirement saving, start now to increase your income. In today’s economic climate, it’s the rule rather than an exception to have multiple streams of income. By saving more earlier, it’s easier to meet your retirement goals. What’s Wrong with Fidelity’s New Retirement Savings Guidelines? If this seems daunting, Fidelity states that these are “guidelines” and not hard and fast rules. That said, there are so many variables that come into play when planning for retirement savings. The guidelines are conservative, meaning, that regardless you’ll have a tidy sum upon retirement, if you follow the Fidelity retirement suggestions. Yet, your retirement situation could require either greater or fewer financial resources in your senior years. How much do you expect to receive from social security and other pensions or annuities? SSA.gov provides a print out of your expected retirement income. Where are you going to live in retirement? If you’re planning on retiring in New York City or London England, you better have a boatload of cash saved up. Retire in Mississippi or Manila, you need much less cash for retirement. What will you do in retirement? First off, what you may do in your 60’s will be quite different from activities in your 80’s and 90’s. If you already have a 401k, you can get a free Blooom retirement account review. Blooom offers a quick look at your 401k investments and helps you find out if you’re choosing the best funds with the lowest fees. I tried it and it was very quick. Do you plan to participate in expensive travel in retirement? If you have plans to travel the world in your later years, you might need more money than a homebody. What are your expectations for out of pocket healthcare? Healthcare is a big unknown. A recent CNBC.com article stated that a healthy 65 year old couple might pay approximately $250,000 on healthcare. This quarter of a million dollar estimate excludes out-of-pocket expenses and long term care costs. Will you work in retirement? My uncle worked part time until he was 80. My father in law, now age 100, worked full-time until age 80. Many of my Uber drivers are retirees, seeking extra cash. I’m certain some of my buddy’s from Home Depot are working part time in retirement. This makes a difference in your cash flow. All of these factors have a tremendous impact on the amount of money you’ll need in retirement. That’s why it’s preferable to over-save and invest than the opposite. According to Zvi Bodie in Risk Less and Prosper, your goals, values, career path and preferences impact how much money you need. You need to estimate the price tag of your retirement vision. Retire abroad (in some locations) and you can live on $20,000 per year. Live in a motor home in your home country and you can keep retirement costs rock bottom as well. Chicago Financial Planner, Roger Wohlner reminds us that financial independence means different things to different people. Like so many activities in life, personal finance choices are personal. It’s helpful that Fidelity is setting approximate benchmarks to quantify the retirement decision. But, review these numbers with caution and an eye for your personal goals and values. In, “How Much Do I Need to Save for Retirement”, Fidelity went beyond their initial guidelines and created some handy tools to help you figure out how various changes in your retirement outlook will impact your future expenses and savings. Their Retirement Quick Check helps you calculate whether you’re saving enough for retirement. 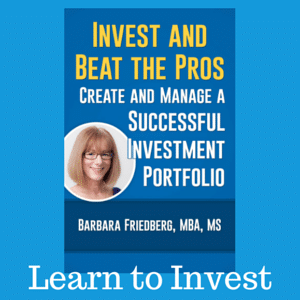 And the Income Strategy Evaluator guides you in creating a retirement income strategy. Read all of our retirement articles. Spend some time evaluating your retirement expectations. And don’t say, “I won’t retire.” Like it or not, everyone comes to a point in their life, either by choice or circumstance, when work is no longer possible. Pull out a notebook or keyboard and calculate how much you think you will need in your 60’s, 70’s, 80’s, and beyond. Ontrajectory is a great tool to help work out your retirement numbers. 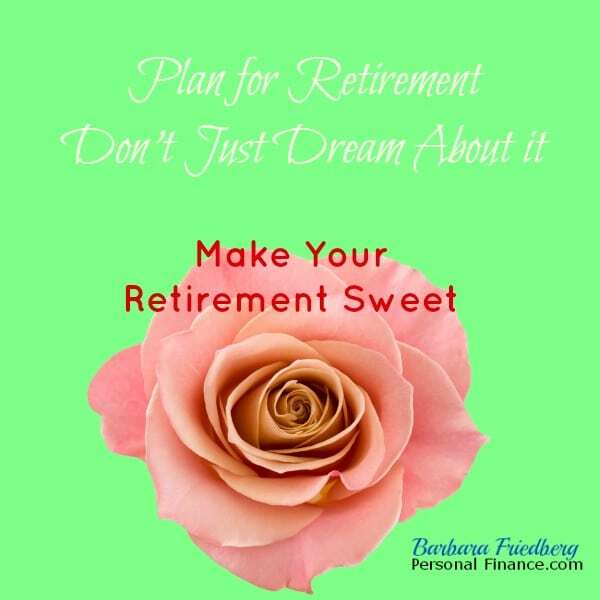 Create a plan for your retirement. And don’t avoid the topic. The earlier you begin saving for retirement, the easier it is go grow your wealth. What do you think about the new retirement guidelines? Are you on track for retirement? I’ll be golden by age 35 but I have quite a way to go before I get there. I don’t think it is a great guideline because there are soooo many variables that a one size fits all is a very dangerous statement. That said, if you follow their guidelines you’ll be better off than about 75% of the people is my guess. Barb first, thanks for including a link to my post. I really like your take on this study. I thought your points about where you might live, what you might do, and the fact that the activities of a 60 year will differ greatly from someone in their 80s or 90s were all excellent and really get to the heart of retirement planning. Retirement planning is not a linear calculation. I am close to being on track, I think if we can avoid 2008 again a lot of people will be in better shape down the road. I don’t think the guidelines are high enough because we are living longer and you will need more money in retirement. Medical insurance is going to be a bigger factor in the future and how you want to live in retirement. Last, long term care will be a factor because we will live longer. You did a very nice job in breaking down some key factors and variables that are often overlooked. 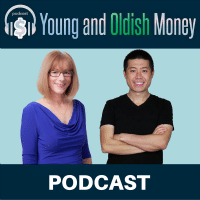 I so agree with Roger’s comments that retirement planning is not a linear calculation and there is a need for a sensitivity analysis such as looking at a few different “what if” scenarios so adjustments can be made or prepared for over time. People like guidelines. For most people, if they asked you how much they should have in their retirement accounts and you said “it depends,” they’d probably get frustrated at the lack of a concrete answer and just give up trying to understand. 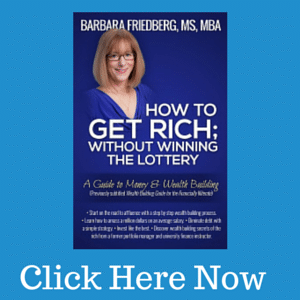 Guidelines are extremely helpful for the majority of people who don’t understand all the factors that go into figuring out how much money they need for retirement. I’m definitely behind on my retirement planning, but I do have a small pension that will come into play when I retire and I also intend to work well past 65 (more like 72+). As well as my health holds up, this shouldn’t be a problem. Side income that I’m working on now will also help in the future. Numbers seem low from my point of view, but anytime you can successfully save 6x your income, have a decent sized emergency fund (25K), and have a paid off home by the time you reach 60 is a success in my book. You might not live lavishly off your nest egg but you will be better than average. So 49% of us aren’t saving for retirement, so I’d say just starting to save would be a big step for 1/2 of America. I won’t be including Social Security in my calculations either. I’d opt out given the option. @Lance-As long as you’re saving and investing while you’re young, you will likely be fine in retirement!!! @Roger-I’d like to check out the linked in discussion. What was the group? @Sean-If history is any guide, there will be market declines in the future, it is the nature of investing in risky assets such as stocks. @Krantc-My personal strategy is to save and invest as much as you can and start young!!! No one knows for certain what they will need in retirement. @Mary, Nice idea about considering “what if” possibilities. Broadens the analysis a bit. @Gen Y-You are absolutely correct and I appreciate you bringing this issue up. If a guideline helps get you going in the right direction, then it’s a good thing! @Little house-The important part is that you’re planning and taking action for your future. @Rich-May be low for some and not for others, but if you meet your suggested benchmarks, then you’re doing ok.
@Brent-As Gen Y mentioned, if the guidelines will get someone started, then that’s a significant impact. I think the best plan will be to start saving in the early twenties, and also make use of the “Don’t spend more than you earn principle”. But your plan is great too. Carmel, Your plan is ideal. Unfortunately, it leaves out those folks who have not seen their 20’s for awhile. Start saving and investing early is the top strategy to conquer retirement planning. I promise I wasn’t going to fire off an angry letter…but I’m glad you continued! The “I’m never going to retire” argument always frustrated me. “Retire” might be a dirty word to some people, but “financially independent” and “working because you WANT to, not because you HAVE to” usually go down more smoothly. @Joe-Yeah Yeah Yeah- Thanks for the semantics lesson 🙂 of course you make a valid point. I’m on track for retirement based on those guidelines, but I don’t FEEL like I have nearly enough saved. I don’t think that planning to work in retirement is a good idea — at least not in the sense of counting on being able to do so. Many folks who would want or need to work aren’t able to at some point. I think I would agree with the new retirement guidelines. If you start saving up for your retirement at a later age, then you need to save more if you would like to live a comfortable life after retirement. As far as our retirement savings, we were behind a couple of years ago. However, since we started budgeting and living frugally, we are now on track of our retirement savings. Retirement is so very personal for a lot of people these guidelines will make no sense. I expect to have “more” expenses during my retirement than I have now. No calculators or guidelines usually account for that. I am also part of the sandwich generation, so I expect to take care of my parents AND pay for our kids college. Which means, I have to save like a mad person now and reduce my savings later. My retirement savings won’t be a linear progression as I age. All put together, spreadsheet it is for me. Looks they they set 67 at the retirement age and are saying 8x puts you in the right spot for middle income. That’s probably just about right if you trust Social Security being there. I think having Net Worth = Salary should come earlier than 35, however. Haven’t considered it in detail, but offhand I’d say 30 sounds about right (don’t quote me!). We’re not where we want to be on retirement savings, but we’ve made so much financial progress in the past few years on debt reduction, that we’re now ready to step things up on retirement savings. I like your thoughts on this study. Retirement means so many different things to different people and it’s being reinvented every day. Good food for thought! It seems they are trying to make these guidelines WAY too simple and general. There’s just too many factors to consider in terms of retirement location and lifestyle to be able to follow this. Guidelines are really important.. It helps people to know everything about their retirement, to decide the right thing, and many more. I think they are great as a basic guide. But as you pointed out, there are a ton of variables that you need to take into account for your wants and needs in life. Use the guidelines as a base, then tweak based on how you envision your retirement. As you said, there are so many variables to retirement, it’s touch to put a number out there. But I think the takeaway, is begin saving for retirement as early as possible. And for some, the numbers give one a goal to shoot for.